Ok, I'll admit it, I'm a little obsessed with Soot Sprites! If you've been following my blog at all you've already seen the bunch of Soot Sprites I made for my Totoros and the Catbus. 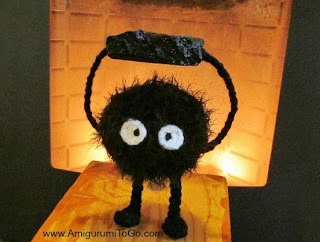 Then just after that I made a Soot Sprite Christmas Tree! All those were inspired by the movie My Neighbor Totoro written and directed by Hayao Miyazaki. 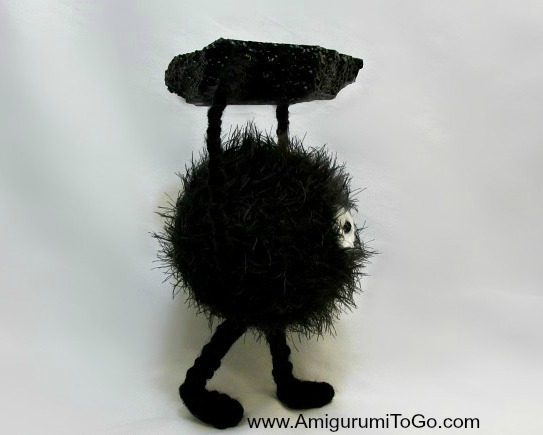 have arms and legs and carry coal. His legs could be a little longer but I wanted these ones to be sturdy enough for posing in front of my stove so I made them on the short side and each leg has a wire. I didn't want him to fall into the fire pit while I took some photos, that would have been tragic indeed! Check back soon to see a bunch of sootball workers throwing coal into my stove and also a pattern for them of course! These ones are a more fun size than my latest soot sprite patterns, these ones can be played with! I's terrific! I want one too!! I love Spirited Away! Thank you! Spirited away is awesome. Hayao Miyazaki is an amazing creator of anime and it would be neat to see some sequels to most of his works. Such as Spirited away.